A recent trip to the city of Instanbul which literally straddles Europe and Asia was truly an awe inducing spectacle. The sights, sounds and scents in this ancient city are thrilling - The Aya Sofia houses Byzantine mosaics you saw photos of in Art History class, incredible tile work lines the walls in the Topkapi Palace Harem, there are shops filled with Turkish Delight and Baklava and spice markets where mounds of Turkish flavors go on for as far as the eye can see. Before leaving for Turkey we did quite a bit of research but never dreamed that we would come back inspired by something that was right under our noses all along: POMEGRANATE Juice! Read more about what we saw on our blog. A moist, veil for the lips in a sultry crimson-pink. 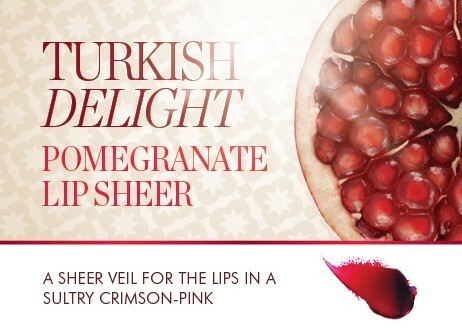 Created in our award winning sheer lipstick formula with an incredible stain that will make you look just like you were eating fresh, juicy pomegranates – without the mess!